Packing an olfa mat? Good idea or not? Thread: Packing an olfa mat? Good idea or not? We're headed down for an extended visit to FL soon. Am taking a Featherweight and some kits I've put together out of my stash. Do you think it will be safe to pack an Olfa mat in my suitcase or do you think the heat will warp it? I can buy one down there but I know if it smells like skunk (as so many of the new ones do), I'll hear from the peanut gallery. As long as it remains flat in the bottom of your suit case, I think you will be fine. I have never had problems with the heat in cars as long as I put the mat in first on the bottom of everything else, so it stays flat. Being in your suitcae it should be even more safe, IMHO. Others may have different information for you. Hope you have a good trip. It's got a bit more substance to it than just the mat, so less likely to warp than a mat by itself. Fits into a medium suitcase, if you're flying. I would think it would be OK as long as the car does NOT get hot. I am even worried about when I move 40 miles south of my current location. It gets HOT in the desert and that will be the last thing in and the first thing OUT !! When I went to Fl. from Pa. I layed my matt flat in the back of my van (or a trunk in the car) and had no problem. As long as the mat is laying flat and covered from the sun it should be fine. I use a June Taylor mat for traveling. It will not warp in the heat, standing up or laying flat. It's a hard surface mat and better for the rotary blade. The blade does not cut into the mat like it does with the self healing mats. I have both types and use which ever one is handy at the time. I think as long as it's kept flat, it should be okay. It should be okay as long as it is flat...and also weighted down by something else....just flat with the heat it could warp, but if there is something on top of it to keep it from warping, it probably will be ok.
Purchase 1 or 2 pieces of foamcore board - looks like stiff poster board, often can find them at Dollar Tree, etc. - and make a "pocket" to hold your board safely. I use duct tape around three sides of the 2 boards, leaving one open so I can slide the mat into the pocket. 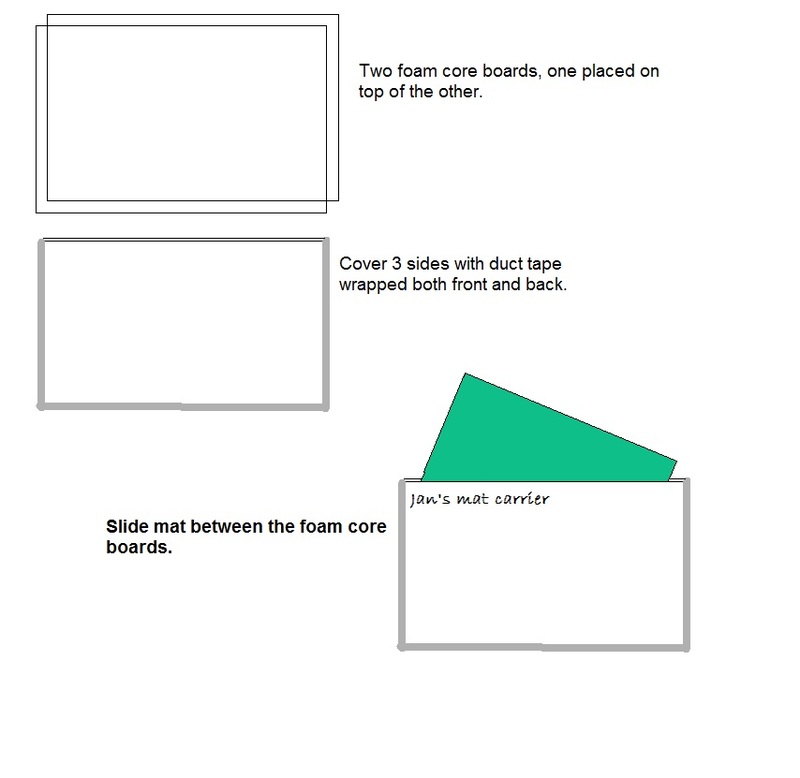 The number of boards you buy will depend on the size of your cutting mat. I made these pockets in several sizes when I lived in Texas, where even placing a mat flat on the floor of the car trunk would allow them to warp from heat. Never had a problem in years after beginning to use these pockets. An added benefit -- cover one side of the pocket (or both if you wish) with flannel or a piece of leftover batting and you have a portable design wall. I even slide my long ruler in beside the mat. Love this folding setup for travel! I have one of these too and I LOVE it! You have a cutting surface and a pressing surface that folds up and fits in a suitcase with no problem. I just took mine on vacation across the country and it was really handy! Very sturdy too -- I don't know how it could be damaged inside of a suitcase. They're on sale right now too! One time I was restricted to my luggage size. I used a large suitcase and put a large mat in it rolling it around other things. Got just about everything in that 1 piece of luggage + sewing machine. Sure like Jan in VA's idea for mat folder. Multiple uses is very necessary when traveling. Using clips to hold it closed would allow for a larger design board when opened up. I'm going to a retreat soon and think a flannel back tablecloth attached to the wall with Command Strips might solve the design wall delimma. [QUOTE=petthefabric;6113751....Sure like Jan in VA's idea for mat folder. Multiple uses is very necessary when traveling. Using clips to hold it closed would allow for a larger design board when opened up. Please note that the POCKET I mentioned is *not* a "folder"......it really is a pocket. Permanently folded, it is a two sided thing that is held together with duct tape on 3 sides, one side left open so the cutting mat can be inserted, no removable clamps necessary. And if you apply flannel or batting to the outside for design board use, that can be applied with tape or glue, still no clamps. Love the pocket idea for protecting mats! Thank you! @ post # 9: Jan in VA, What a great idea Jan. I will put this on my to make list. Thanks a bunch! I am flying. Your idea is great, Jan. I have a little folding Olfa Mat that could go. I'm going to try to precut and kit up some projects but I may want something bigger. I'll see about the June T. Ones, didn't know the self healing dulls blades. Self healing mats like the green OLFA ones do NOT dull blades. These have been used for decades in the engineering field. It's mats made to compete with Olfa - especially Fiskars and other hard surface ones - that dull our blades. Though they are labeled "self healing" they are not of the same 'space age' substance as Olfa uses. Jan, you are full of good ideas that work. I'm gonna do this. Thanks for the info. When I travel I have a mat attached to an ironing board. This keeps flat any time . When I travel I have several small Olfa cutting mats that I just lay together to make a larger one when I get to my destination. I travel a lot with them and have not had any problems with them warping or shifting when I cut on them when they are laid together. I bought a white mat at our quilt show that rolls up for storage or travel. I like it better than the hard green ones. It comes in all sizes and I have a huge one for my cutting table and a standard size for my "move" about cutting. It is a Sew fit 1-800-547-4739 or Sewfit.com. Have had them for several years and prefer to Omnigrid. At the price of those mats I would not chance the folding of it...I would buy a cheap mat when I arrived in FL. I'm sure if you pack a mat in your suitcase so that it's flat, you should be all right. Have fun on your visit to FL. Left this one car lying in car for a short time and it warped!